It's all about the SPRINKLES baby! 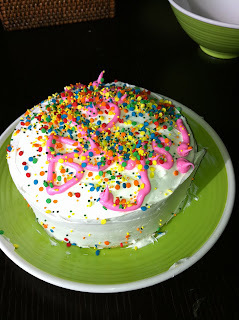 Can you read what I wrote under the Sprinkles? YEAH, I DIDN'T THINK SO! SOOOO...I had the moment all worked out in my (crazy) head. I was making a mack-daddy home-cooked meal for the boys to celebrate the aforementioned first-ever "We love our Boys" day (in case you're wondering who the BOYS are, I'm referring to Jake & Daddy.) My assistant chef Baylie and I were going to top it off with a cake...ON A MONDAY...I mean c'mon, who comes up with this stuff?! So, I wrote "We (heart) Boys!" on the cake and Baylie was supposed to jazz it up with "SOME" sprinkles, NOT the whole FREAKIN' jar! I know it's completely wrong of me, but when I turned around and saw what she did to our (MY) cake I had one of those Ally McBeal moments, if you weren't around in the 90's you don't have a clue what I'm talking about (YouTube it! ), but those of you who were KNOW EXACTLY what I mean, so I won't go into detail (for so many different reasons :). Anyways, I took a deep breath and realized, you know what, this was her way of expressing herself, her "ART" if you will (ok, you don't have to go that deep, but in the spirit of full disclosure, I'm sharing the good, the bad and the ugly when it comes to my looney tune thoughts :). So I let her live (kidding, sort of) and I embraced the sprinkles (I'm pretty sure I now have a cavity or at the very least chipped some of my "dental work" devouring my piece of cake...no matter how bad it looked, I don't discriminate when it comes to dessert sista! --- and just a side note, yes, dessert is spelled with not one, but two s's - the other is a desert and it's VERY HOT! That one drives me KOO KOO!). So circling back around...SPRINKLES are the new BLACK! At least the younger generation's version of the new BLACK (the 4-6 year old crowd, that is). So "WEAR IT!" as Baylie would say (although I'm not sure where exactly she learned that phrase, probably from YOUR daughter, because MY sweet daughter would NEVER come up with that on her own ;)....I'M SO SURE!